IQD’s new IQCM-160 disciplined OCXO module is housed in a 30 x 25 x 14.6mm hermetically sealed through-hole metal package which covers approx. half the area of the current models. The IQCM-160 can achieve a holdover specification of 1.5 microseconds over a period of 8 hours when locked to a 1PPS (Pulse Per Second) input from an external GPS, GLONASS, BEIDOU, GALILEO or alternative 1PPS source. The design incorporates an internal adaptive algorithm which enables the module to ‘learn’ the parameters of the GPS signal after a period of 2 days of lock so that the holdover function can start in the event of signal failure. An internal alarm is built-in to indicate lock failure and subsequent restoration of signal. In addition, the unit incorporates a serial connection for more detailed interrogation of the device’s performance. Frequency is accurate to within ±0.005ppb when locked to a 1PPS external signal and can compete with the performance of many atomic clock references. The standard operating temperature range of the module is -40 to 85 degrees C. The required power supply is 3.3V with the output being standard HCMOS. Current consumption is only 750mA maximum during warm-up with this reducing to 350mA once the steady-state condition is reached. The IQCM-160 has 1PPS and 10MHz output and also UART interfaces for software management, this has a fixed baud rate of 115200 using 1 stop bit and no parity. 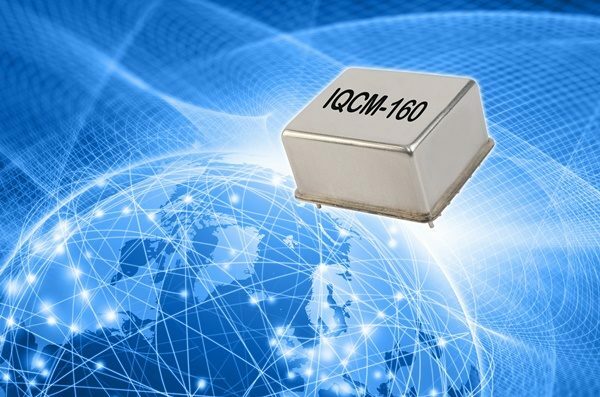 Intended for a range of applications including land based telecommunications systems as well as marine based navigation systems the IQCM-160 forms part of a range of highly specified modules and Oven Controlled Crystal Oscillators (OCXOs) available from IQD. Packaged in ‘Bulk’ either direct from IQD or via its extensive range of worldwide distributors. Further details are available on IQD’s website at www.iqdfrequencyproducts.com or for further advice, speak to a member of our Applications Support Team. Meet IQD on Stand 247, Hall 3 , at Embedded World 2019.